St. Patrick's Day. A world-wide festival celebrating all that's great about being Irish and Ireland. It's upon us again and that's no bad thing. St. Patrick's Day puts us in a good mood. Heck, it puts the stock market in a good mood. When you think about the size of Ireland the "brand awareness" of St. Patrick's Day is incredible, although the loud, celebration-style St. Patrick's Day is an American invention. In Ireland St. Patrick's Day was traditionally a Holy Day - the pubs were closed and Catholics were obliged to attend Mass*. In recent years St. Patrick's Day has turned into something of a nation-wide party in an attempt to steal some of New York & Boston's thunder. St. Patrick is an important person in Irish history. He brought Christianity to Ireland and the Irish took to it like ducks to water. Not long after Patrick's death the Irish were sending out missionaries throughout Dark Ages Europe, bringing the faith and learning to the peoples of Europe and saving civilization. So Patrick was, as it turns out, crucial to all of Europe, not just Ireland. Given all that, wouldn't you imagine that somewhere in Ireland there would be a mega-center catering to all those who want to know about St. Patrick? Don't you think there'd something touristy to appeal to the keen and, more importantly, the vaguely interested? That to me is the model - "Cooperstown" devoted to St. Patrick, only one that's easier to get to than Cooperstown is. A place completely committed to telling the story of Patrick and and all the knock-on effects his mission to Ireland has had. So the need for "Patrickstown" is established, but where? There are places all over Ireland that can claim some connection to Patrick. There's Tara, Co Meath where he stood up to the pagan powers that ruled Ireland and won them over to Christianity. There's Armagh, where he established his main church. There's Croagh Patrick in Mayo, where Patrick fasted for 40 days. And then there's Downpatrick, where St. Patrick is buried. "Whoa!," I hear you yell. 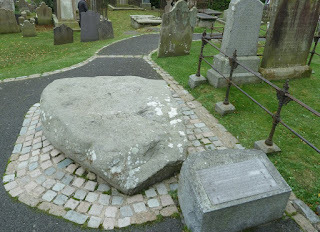 St. Patrick's grave is known? Well, it's one of those things where you don't want to look for too much by way of evidence, but yes there is a grave in the grounds of Down Cathedral that is (supposedly) St. Patrick's grave. That gives Downpatrick a solid claim to be the host of the St. Patrick mega-center, but I think it's really too far off the beaten path like Cooperstown. Deciding where to locate the St. Patrick mega-center is another issue where American input can help. Any official attempt at developing a St. Patrick mega-center is going to lead to some heavy-duty lobbying for the various contending locations. Oh, and there's the whole north-south thing too. No harm having an independent American perspective given that complication. We need a big solution to a big hole in our tourism offering. We need help from people who are indifferent to the pleadings of a dozen possible locations and tuned out to the problems associated with the border. All we really need is a proper business proposal and business plan for the creative attraction that respects the truth and real history on as far as makes sense for the project. The St. Patrick mega-center needs America. * It's still a Holy Day of Obligation here, probably one of the better observed Holy Days. Ireland needs to "drill baby drill"